Best in the early morning or evening to view Kangaroos and Emus. A gentle track leads through Fyans Valley to Tandara Road. The track then crosses Fyans Creek and continues back along the foothills of the Mt William Range to Brambuk Cultural Centre. Start: Carpark opposite shops in Halls Gap. Walk through the carpark, past the swimming pool and cross the school road. Follow the track and cross the pedestrian bridge to the right, over Stoney Creek to the Botanic Gardens. The track winds along the creek and past some towering sandstone cliffs. The delightful Venus Baths rockpools are just beyond a foot bridge. Return to Halls Gap by the same route or cross the foot bridge and follow the track on the opposite side of the creek. From the Halls Gap shops, walk through the carpark past the swimming pool and turn right at school road. Cross over Stoney Creek on the vehicular bridge and turn left at the tennis courts. Follow the walking track through the Botanic Gardens and onto the Bullaces Glen Walking Track. The track winds its way up the rock steps to Mt Victory Road. Carefully cross the road and begin a short climb to a waterfall at Bullaces Glen. Cross the creek and follow signs back to Halls Gap. From the recreation Oval follow a signposted track through open forest to the foot of Clematis Falls. They are best in winter and spring or after rain in summer. Return by the same route. 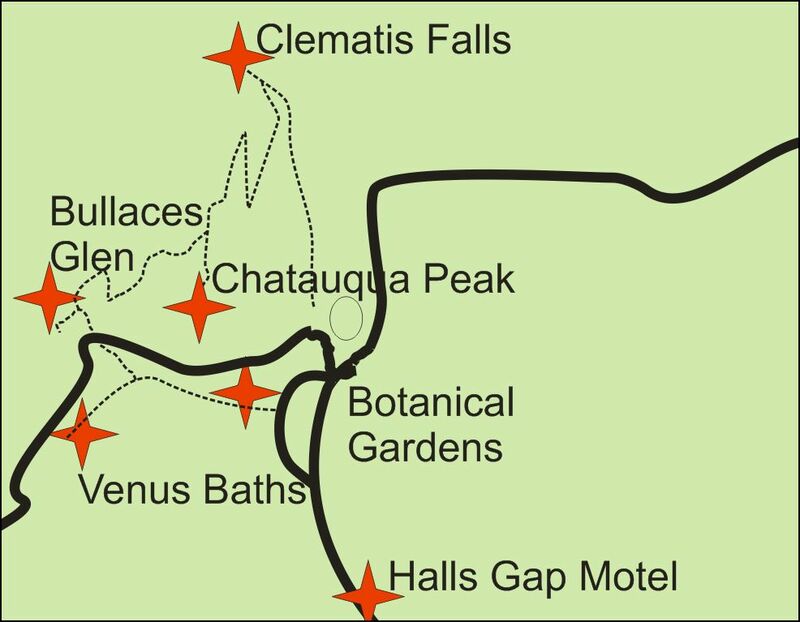 From the recreation Oval follow a signposted track through open forest to the foot of Clematis Falls. Return 100 metres to an intersection and follow signposts along rocky areas, climbing steeply up to the summit of Chatauqua Peak. Return to the main track and follow signs to Halls Gap via Bullaces Glen. Continue down through a fern grove to Mt Victory Road. Carefully cross Mt Victory Road and continue through the Botanic Gardens to Halls Gap. If you want to see towering rock walls take this short walk, through the magnificent Grand Canyon. After leaving the Canyon turn right and return to Wonderland Carpark down the rocky terraces. Starting at the southern end of the Wonderland Carpark, follow the track as it climbs gradually through stringybark forest. Meander along Stony Creek and take the track to the lookout area opposite the waterfall. Turret Falls is best viewed after rain when water cascades over the rocky terrace. From the Sundial Carpark follow the signs to Sundial peak. Where the track forks about 50 metres from the carpark take the right hand track. Follow signposts through heathy forest, gradually ascending. One final climb up a rocky staircase will give you panoramic views over Mt Rosea and Lake Bellfield below. The Sundial area has a wide array of wildflowers on show during spring. From the Sundial Carpark follow the signs to Sundial peak. Where the track forks about 50 metres from the carpark take the left hand track and follow the signs to Lakeview Lookout. Enjoy views across Mt William Range and Lake Bellfield. 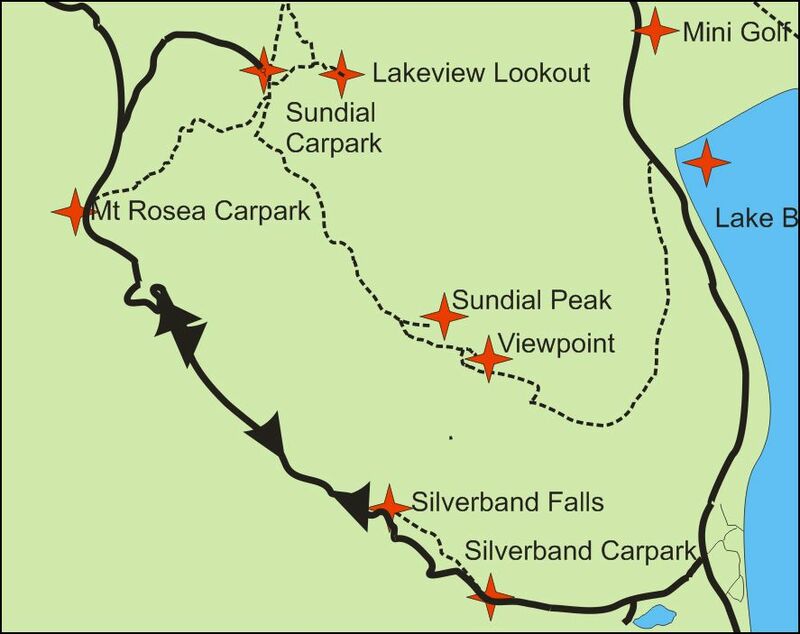 Return to sundial carpark by following the loop track to the intersection of the Pinnacle Track. Here turn left back to the carpark. There are plenty of wildflowers here during the spring. Cross Fyans Creek footbridge and begin a steady climb through tall messmate forest and native pines, along the western slope of the Mt William Range. Turn right at the signposted intersection. A scramble up the rocky summit rewards you with superb views towards Lake Fyans and over the Fyans Valley. Return by the same route. From Silverband Falls Carpark amble down a gently graded path through a ferny forest. A sign along the way tells the story of a visit many years ago, by an early naturalist. this area is also home to a large variety of colourful birdlife. Cross the bridge then follow the track to arrive at the base of the falls. The falls once disappeared underground at the base of the falls but this is no longer the case due to natural evolution. From Wonderland Carpark cross the footbridge into the spectacular Grand Canyon at the end of the Grand Canyon Turn left at the top of the stairs and follow the signs up the rock platforms. The steady ascent winds through rocky woodland, Past the Cool Chamber, Bridal Veil Falls through Silent Street rock formation and on to the awe inspiring Pinnacle Lookout. Note across the rock areas of the track there are yellow triangles makers to help identify the track. Return to Wonderland Carpark via the same route. From Sundial Carpark Follow the track through rocky woodland . from here the track climbs steeply along the ridge providing scenic views all the way to the Pinnacle Lookout. Return via the same route.